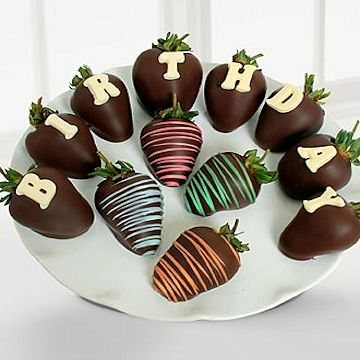 The Chocolate Dip Delights™ Birthday Berry Gram 100% Real Chocolate Covered Strawberries will be the perfect gift for your special recipient on their big day! A dozen gorgeous, perfectly ripe strawberries are dipped in the richest, most decadent dark 100% Real Chocolates, then drizzled with thin multi-colored confection ribbons in the shades of red, green, blue and orange, or topped with white chocolate B, I, R, T, H, D, A, Y to create a wonderful way to send a sensational happy birthday gift. Presented in an attractive gift box, this gourmet offering will help create a wonderful sentiment that lends to the celebration of their special day.